Today the forest is enveloped with an unusually thick blanket of fog, swallowing the towering mountaintops and illuminating the multitude of greens splattering the woods. So gently the rain falls that when it comes to rest upon a blade of grass, it barely bows. There is, however, enough moisture that it turns the rocks lining the trail into a glistening, slippery surface and constructs miniature ponds at every dimpled point along the terrain. These mountains are undeniably majestic, teeming with brilliant plant and animal life. To hike to this elevated splendor on foot, particularly with today’s weather, would be unreasonable and entail an entire day or more. To travel via auto would guide you only a short distance, as you would quickly encounter trails too narrow and especially intricate and unyielding for any four wheels. If you wish to access the botanical bounty near tree line, then a degree of creativity must be applied. Brady Becker and Shae Whitney of DRAM Apothecary have achieved exactly that, utilizing a tool that grants them unique passage to forage untapped regions of the abundant Colorado mountains: a motorcycle. If you are fortunate enough to discover Silver Plume, Colorado, it would not be unusual to experience a sense of enchantment upon arrival. This “living ghost town” is lined with charming Victorian homes, dirt roads, and a gentle creek that slowly meanders through town. It is the kind of area that would fully ignite your imagination with its rich history and 150-year-old architectural remnants that still haunt the streets. In the 1880s this area would have been swelling with over 2,000 residents, mainly composed of silver miners and their families. Legend says silver was so plentiful during the time that much of it lay in feather-like formations—a plume—giving Silver Plume its name. Though present-day Silver Plume is home to less than one-tenth of its peak population, it still retains plenty of mystery and magic. One of the more enigmatic buildings still standing is the Knights of Pythias Lodge (the K.P. ), where a secret society once held their private meetings and where an episode of “Unsolved Mysteries” was filmed. While some may call this structure haunted, DRAM Apothecary just calls it home. The K.P., located 9,114 feet above sea level, is where DRAM crafts their exquisite bitters, syrups, sodas, and teas. In 2011, motivated by their passion to create a healthy, sustainable, and completely natural product, Becker and Whitney moved to Silver Plume and founded DRAM. 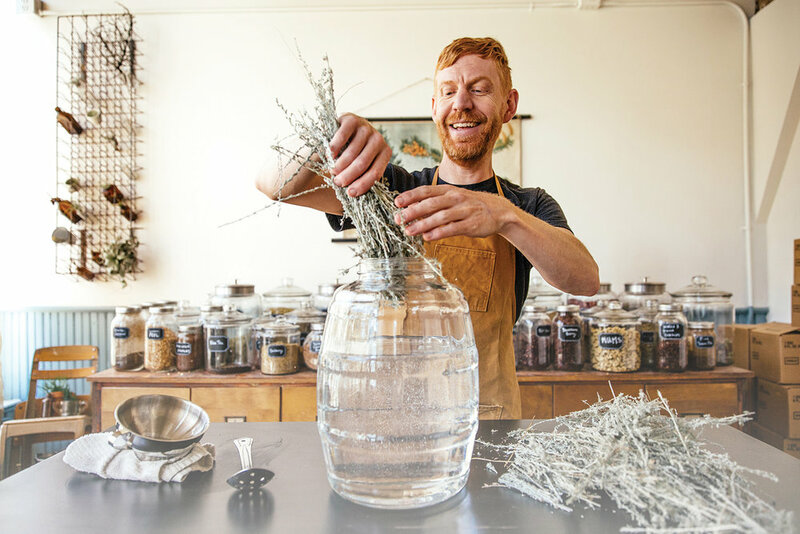 The area’s surrounding plant life fuels the pair’s creativity as well as the ingredient list for their bitters. A high concentration of medicinal herbs, roots, or flowers in either alcohol or glycerin, bitters can be incorporated into your daily diet for vibrant health and agreeable digestion or as a flavoring component for cocktails. Today, Becker is going to prepare a batch of their Wild Mountain Sage bitters. Although the sky is ominous and the rain is drizzling, it does not stop him from venturing into the woods on his dirtbike in search of the main ingredient: wild sage. Becker’s KTM 500 EXC vastly expands his foraging grounds and provides him access to areas that would otherwise be too remote to reach. As a proficient motorcyclist of nearly 20 years, Becker is just as connected to his bike as he is to the environment that surrounds him. Raised by a mother who is a master gardener and florist, Becker has an uncanny understanding of and respect for plant life and knows precisely where to take his motorcycle to uncover the sage. A brief jaunt down a frontage road and Becker is at the trailhead of Grizzly Gulch, located between two magnificent 14,000-foot peaks being devoured by fog. Swiftly moving through the freshly made ponds and rushing rivers, Becker effortlessly maneuvers his bike higher and higher up the trail. Though the rugged terrain is daunting to tackle on foot, the two wheels glide over it with ease. The trail becomes steep and covered with wet, shifty boulders. Unfazed, Becker coasts up the ice-like surface without even the slightest wobble. What would be an all-day adventure to set about afoot Becker accomplishes in less than an hour on his motorcycle as he finally reaches the secluded haven. As if Mother Nature were expecting him, the rain ceases and the fog dissipates, unveiling the impressive mountain peaks still capped with snow. There is an incredible silence blanketing the woods, with the occasional chirp from a bird or splash from a water droplet meeting the ground, interrupting the peaceful quiet. An imaginative brain isolated in these woods could conjure the most terrifying scenarios; every rustle amongst the trees could be a mountain lion stalking you, a hungry bear lurking about, or even an giant bigfoot fuming over your intrusion on his territory. With no time for such head games, Becker sets off to gather wild sage for his bitters. Luckily, the field is generous today and there is more than enough sage to fill Becker’s large bags, which fit perfectly on the back of his bike. A mere two hours later, Becker is back at the K.P. ready to produce a batch of Wild Mountain Sage. Becker and Whitney carefully handpick most of the ingredients for the bitters, intimately connected to every bottle they create. They both boast an extraordinary understanding of their environment and how to artfully utilize the plants in their own backyard to create a delicious and healthful product. Equally impressive is Becker’s knowledge of the land and crafty use of his motorcycle to source the ingredients. 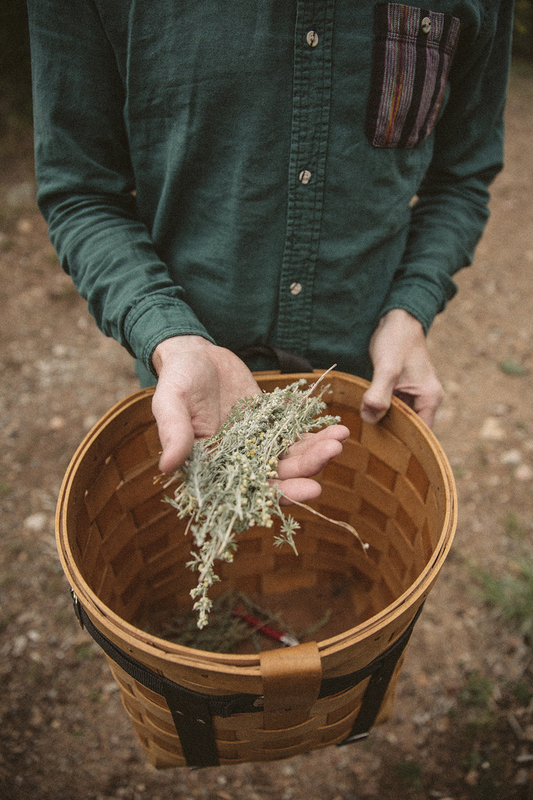 This batch of Wild Mountain Sage will contain glycerin, water, sage, orange peel, gentian, and a dash of love provided by Becker and his rainy day adventure on his motorcycle into the foggy Colorado woods.